Thyroid problems are more common in people with diabetes than they are in the population as a whole. But what is the nature of this link and how do you treat thyroid problems?People with diabetes have an increased risk of developing a thyroid disorder. In the general population, approximately 6% of people have a thyroid problem in some form or other. However, this percentage increases to more than 10% in people with diabetes. Indeed, thyroid disorders are very common in the western world … second only to diabetes as the most common condition to affect the endocrine system. The endocrine system is a group of glands that secrete hormones that help regulate the use of nutrients by cells, ie these glands play a central role in the proper functioning of your metabolism. Abnormal thyroid function can have a major impact on the control of diabetes … untreated thyroid disorders can increase the risk of diabetic complications and can aggravate symptoms of diabetes. But thyroid problems can easily be diagnosed through simple blood tests and effective treatment is available. Anyone with diabetes should be screened periodically for thyroid disorders. 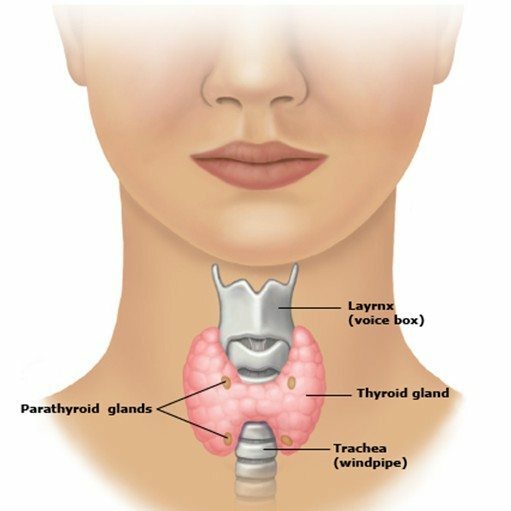 The thyroid gland is shaped like a butterfly sitting around the windpipe in your neck between your Adam’s apple and your collarbone. It makes two hormones, T3 and T4, which set the speed for your metabolism … how fast your heart beats, how deeply you breathe, your body temperature, and how your body uses insulin are thyroid-related functions. Hyperthyroidism, ie too much thyroid hormones being produced, increases insulin resistance, while hypothyroidism, too little of the hormones being made, raises cholesterol. Hypothyroidism is far more common than hyperthyroidism. Both hypo- and hyperthyroid greatly increase the risk of heart disease. The symptoms vary with age and gender, and whether you have hypo- or hyperthyroidism. The symptoms of hypothyroidism include feeling tired, feeling cold, gaining weight, experiencing depression, dry hair and skin, and constipation. With hyperthyroidism you are like to experience weight loss, rapid heartbeat, shortness of breath, sweating, muscle weakness, and diarrhoea. Both kinds of thyroidism, hyper- and hypo-thyroidism can cause a goitre, a swelling of the neck as the thyroid grows bigger. Many of the symptoms are very similar to the symptoms of type 2 diabetes. For example, one symptom of a thyroid problem is cold feet. But someone with type 2 diabetes can easily mistake this symptom for diabetic neuropathy. Because you can’t really tell from the symptoms alone whether you have a thyroid problem, you should get your thyroid checked regularly through blood tests. This is usually done by testing your blood for TSH, the thyroid-stimulating hormone. TSH is the hormone your pituitary gland uses to tell the thyroid to get working. If thyroid function is low, the TSH level in your blood will be high which signals that your thyroid should be producing more thyroid hormones. If the thyroid is overactive, TSH will be low, trying to slow it down. A TSH level between 0.4 and 4.0mU/L (milliunits per litre) is considered normal. But some people can have significantly low thyroid functioning with a TSH of 2.0–4.0mU/L. Levels in this range may already be raising your lipids to harmful levels and possibly your glucose. In some European countries, patients with a TSH above 2.0 mU/L can be put on thyroid medication. There are three things you must do to manage thyroid problems … get tested periodically … take prescribed medicines, and … eat a thyroid friendly diet. Testing … according to the American Diabetes Association (ADA), anyone diagnosed with Type 2 diabetes should be checked for thyroid disorders and then at five-year intervals thereafter. Those with Type 1 diabetes should be screened every year. It’s also a good idea to be tested whenever you have unexplained changes in your glucose levels. Medicine … hypothyroidism can be treated with levothyroxinen, a synthetic version of T4, the main thyroid hormone, which is made and released by the thyroid gland. However you have to try it out at different doses to find the best dose for you, which can take several months. But levothyroxinen does not work for everyone. However, there are other medications, such as liothyronine, that can be used instead. Note that it is important to take your thyroid pills every day at the same time. There are medical and surgical treatments for hyperthyroidism as well. Diet … eating the correct foods makes a difference. Iodine is the most important nutrient for your thyroid. It is added to most commercially-sold salt in Europe and North America. If you use other, more specialist salts or no salt, you may need to ingest more iodine. Sea vegetables (seaweed) and sea animals are the best sources. The most common form of thyroid issues is hypothyroidism, ie a sluggish thyroid that is under-performing. Medicine … take the correct amount of medicine as directed by your doctor. Don’t skip doses and take it at the same time of the day. Taking it at varying times during the day can prevent it working as it should. As you will probably have to take it for the rest of your life, make it part of your set daily routine. Take your thyroid medicine on an empty stomach. Food can decrease its absorption, especially foods high in fibre. High fibre foods are good for you, so don’t stop eating them … just eat them several hours before or after taking your thyroid medicines. Avoid taking calcium supplements or supplements that contain iron (such as a multivitamins) along with your thyroid medicine as these can also block absorption of the medicine. Food … cruciferous vegetables such as broccoli, cauliflower, Brussels sprouts, and cabbage can affect the production of the thyroid hormone. These are very healthy foods, so you must continue to eat them …. just don’t eat them at the same time as you take your medicine. Cooking these vegetables seems to lessen this effect. Go easy with soy foods … soy contains genistein, which can decrease the production of the thyroid hormone … and, while you should keep eating them, do limit them to a few times per week. Eat foods that boost the production of the thyroid hormone. These foods contain nutrients such as B vitamins, selenium, zinc, tyrosine, and iodine. Poultry, seafood, lean meat, whole grains, onions, beans, almonds, avocados, seeds, and low-fat dairy foods may be helpful. Avoid or limit fatty and sugary foods … just as you do to control your diabetes. Watch your portion sizes. This seems like a no-brainer … if you need to lose weight, cut back on how much you eat. A deficiency in iron is one cause of hypothyroidism. Ask your doctor to check your levels of iron if you have hypothyroidism. Don’t take dietary supplements, such as iodine supplements, geared towards treating thyroid problems without first discussing this with your doctor. Also, don’t stop taking your thyroid medicine in the hopes of “treating” hypothyroidism by diet alone. Exercise … is not necessary to solve your thyroidism (or your diabetes) but helps the process. Keeping fit with a daily exercise routine will boost your efforts … you will also feel the better for it. Thanks to your advice, I controlled my diet and reduced my sugar level from 22.5 in October 2017 to 5.7 in October 2018. Again, thank you so much for your very useful guidance. Setting to work on my hypothyroidism!